Rail maintenance within the timetable. Axle loads, high speeds, load tonnage, heavy acceleration and heavy deceleration cause the contact between the wheel and the rail to produce rail defects such as head checks, corrugations and slip waves. Consequently, rails that have not been reprofiled have to be replaced far too early and at considerable expense. Our solution for standard-gauge routes: intelligent and preventive maintenance using the HSG-2. High Speed Grinding (HSG) doesn't just remove minor and median rail defects; it prevents defects from forming and thus prolongs the rail's service life by up to 100%. Thanks to high operating speeds of up to 80 km/h, the HSG-2 is extremely flexible and can be scheduled to slot into any timetable without any track closures whatsoever or having to prepare the track in advance. The HSG-2's revolutionary technology allows up to 60 km of track to be ground non-stop. It produces virtually no sparks or dust during the operation and effectively reduces the noise emitted by rail traffic by 3 to 10 decibels. To supplement to its purely rail-machining role, in the future the grinding train will also be a diagnostics vehicle. Equipped with measuring and testing technology, the HSG-2 will log the condition of a rail during every pass and in so doing compile a database for our revolutionary and highly efficient maintenance concept, Smart Maintenance. As little as possible and as much as necessary – thanks to intelligent maintenance planning and sophisticated technology, High Speed Grinding deliberately removes only a little of the valuable rail metal. The hardened surface layer is removed, which at the same time optimizes the rail's cross-sectional and longitudinal profiles. The HSG-2 achieves this thanks to its special grinding wheels, which are arranged in rows and made to rotate across the rails by the train's forward motion. What is so special here is the infinitely variable adjustment of the angle of the grinding wheels, which enables them to be positioned at the exact angle required to achieve the desired results. And since they rotate passively and the hydraulically controlled grinding pressure is constantly monitored while the train is in operation, grinding defects such as periodic drag marks or bluing are ruled out right from the outset. Especially efficient and safe: Four rows of grinding wheels are mounted in each of the HSG-2's revolving grinding units, allowing an easy change-over from used grinding wheels to new ones while the train is in operation. The replacement of used grinding wheels in the machine's interior is also quick and easy. The HSG-2 can machine up to 250 km of track non-stop in a single shift without a single member of the crew having to leave the train. And thanks to its modular construction, two grinding trains can be coupled together into a high-performance twin version. 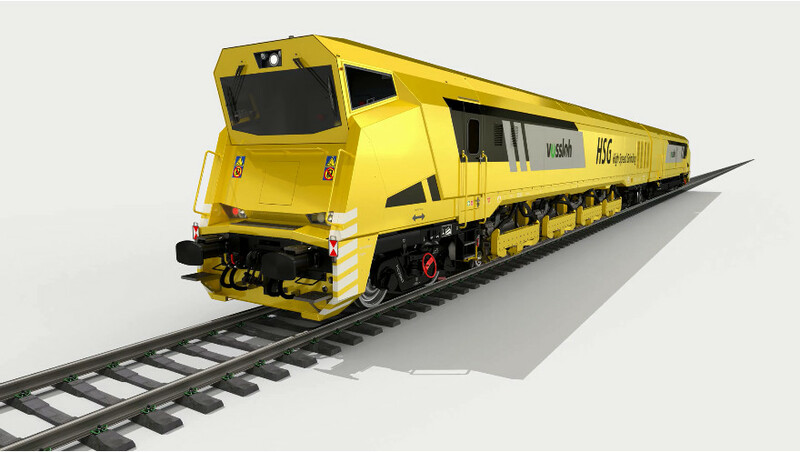 Quick and safe – The HSG-2 is the only grinding train in the world that can machine the rail profile at speeds of up to 80 km/h during normal railway operations and grind turnouts fitted with movable point frogs. Track closures and elaborate preparations are thus now a thing of the past. Thanks to the special positioning of the grinding units, switching equipment does not need to be dismantled in advance and the rails can be used for normal railway operations immediately after machining. HSG used in combination with Flexis can preventively machine entire route sections without disrupting the schedule. Clean, efficient and particularly suitable for use in tunnels – The effective dual extraction system on either side of the grinding wheels collects the grinding dust produced and stores it in an integrated dust bunker. This bunker has a large storage capacity, so grinding 250 km of track in a single shift without emptying the bunker is no problem at all. What's more, the rotating grinding wheels produce comparatively few sparks. Quiet and comfortable – One of the main sources of rail noise is the rolling sound emitted by the wheels. The more corrugations or slip waves there are on the rail surface, the more noise is generated. This can even lead to annoyingly high-pitched squealing noises in the worst cases. High Speed Grinding smoothens out the rail, optimizing the wheel-rail contact and reducing the rail surface roughness that produces noise. 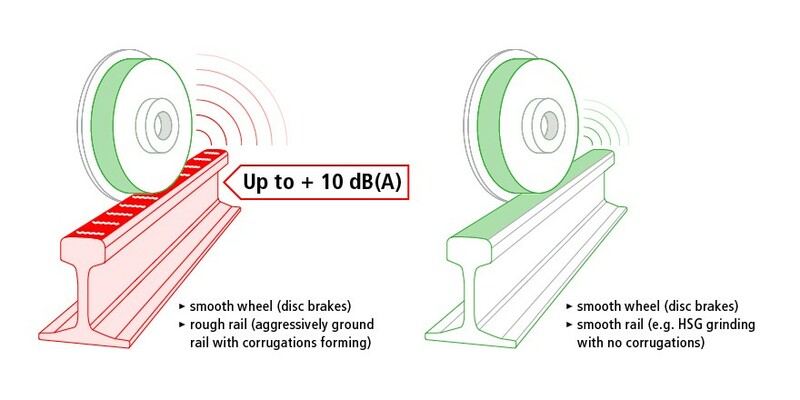 Preventive rail maintenance using the HSG-2 improves rail acoustics considerably by up to 10 decibels. This results in distinctly quieter rail traffic, and the squealing sound typically heard after rails have been newly ground is also noticeably absent. And not only that: the machining itself is comparatively quiet, which in turn significantly minimizes the stress for passengers and residents in the area. In addition to its role as a grinding train, in the future the HSG-2 will also serve as a diagnostics vehicle. The machine will be equipped with measuring and testing equipment that measures the longitudinal and cross-sectional profiles during each pass. The data collected forms the basis of our Smart Maintenance concept, the revolutionary maintenance planning app developed by Vossloh. Smart Maintenance allows you to control the maintenance of your network more easily and efficiently than ever before. Find out more about Smart Maintenance. Since 2007, HSG-2 trains have been in operation on a host of different rail lines all around the world. Officially recommended by the Chinese ministry responsible for the maintenance of high-speed rail lines.